A waterproof jacket doesn’t have to be a big burden in the pack or on the back, and we’ve been out and about over the past few months in this selection of lighter jackets designed to keep the elements at bay. Our tests revealed that, in many cases, you don’t have to sacrifice performance for a lower weight. The best garments provided all the protection you might expect from heavier jackets. We tested them for how well they kept out the rain and wind, protected the head and face and how well they shifted perspiration, especially when working hard. We evaluated them for comfort and how well they packed down into the rucksack, as well as design and manufacturing quality and finally gave them a rating for value for money. It’s important to point out that, because most of the jackets use lightweight fabric so don’t provide much in the way of insulation, though they do block the wind well. So if you’re heading for the hills on cold days, you’ll need to layer up and pack the appropriate clothing to keep you warm too. We did intend concluding this test earlier in the year, but one of the driest summers in decades rather delayed our ability to go out and enjoy the rain! Berghaus says this is the most breathable three-layer jacket in the world, and the brand has packed a lot of features into this lightweight top, developed by the MtnHaus team. The design is minimalist, but with an eye on maintaining performance. Weight is kept low by the omission of features such as pit zips, but the Berghaus designers have introduced novel ways of allowing air to circulate within the jacket via its storm vents. The GR20 Storm’s main zip still has double pullers and is backed by a storm flap. This kept out the weather well during testing. The jacket’s hem has v-cuts at the sides to help unrestricted movement, with elasticated drawstring adjustment with sprint toggles at the rear. There are two zipped handwarmer pockets, lined with stretchy mesh, which again helps breathability. There are stormflaps behind the zips, which can be opened if not being used to carry any items, to provide extra venting. The hood is well designed, with a slightly stiffened peak. Adjustment is simple and effective, with a rear shockcord arrangement and spring toggle providing both volume adjustment and front cinching. The hood stayed up well in strong headwinds and turned with the head when tightened in. The hood also accommodated our climbing helmet. There’s a soft chinguard at the front of the hood. The sleeves don’t have any adjustment, again to keep weight down, but there is an extended cowl at the top of the sleeve which covers part of the hand, and the lower section of the cuff is elasticated. This arrangement provided no problems during our testing, with the sleeves staying in place and keeping out most of the draughts. The GR Storm’s vents are its most innovative feature. There are twin vents on the chest area. There’s one on the back, above the area normally covered by a rucksack, and three down each side of the jacket. All are protected by a flap tacked in the middle, and they all kept out the rain while providing a tangible amount of cooling ventilation. The two chest ones are positioned in a place that might coincide with a rucksack sternum straps, so we had to ensure this didn’t lay across the vents and flatten them, negating any advantage they might provide. The whole jacket is designed to provide full weather protection while allowing maximum breathability and escape of moisture during exertions. Berghaus said it uses a special variant of Gore-Tex Active, and breathability was very good for a jacket that uses a membrane. The fabric is very lightweight but felt robust enough, standing up to testing without any detriment. Mobility was good, with no riding up when reaching up for holds. The GR20 Storm is an impressive piece of kit that will appeal to those who want to move fast and keep down weight while keeping out the weather. It’s not cheap, but the quality is good and a lot of thought has gone into the design. The Columbia jacket is another pared-down waterproof, and is actually the lightest in the test. 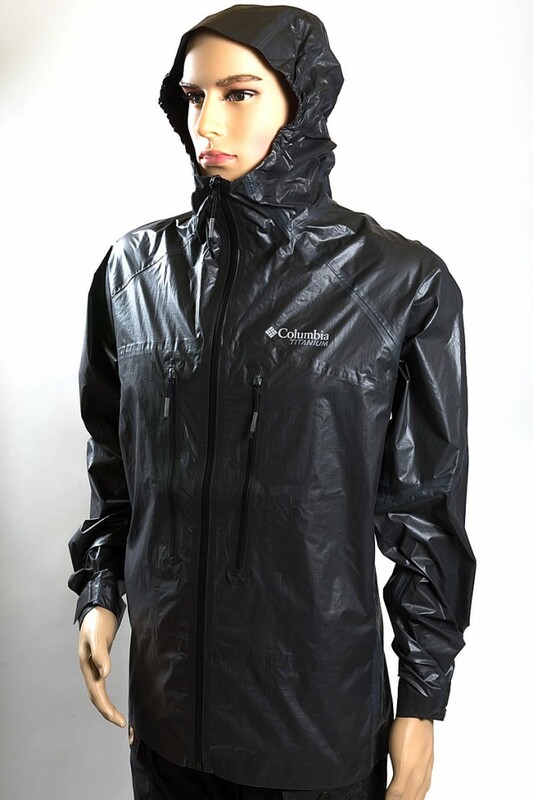 It uses the OutDry Extreme waterproof material, an ‘inside out’ fabric. Most membrane-based waterproof systems have a face fabric treated with a durable water-resistant treatment, with the membrane underneath that. The OutDry Ex Featherweight has its waterproof membrane on the outside, along with the seam tapes that keep the water out. This gives it its distinctive ‘plasticky’ look. The lining is more conventional fabric, with polyester mesh lining the pockets to help breathability. The jacket’s main zip has a single puller, and is backed by a storm flap. The hood has an adjustment shockcord, secured by a friction toggle, which was easy and quick to tighten, but fiddly to loosen, particularly when wearing gloves. 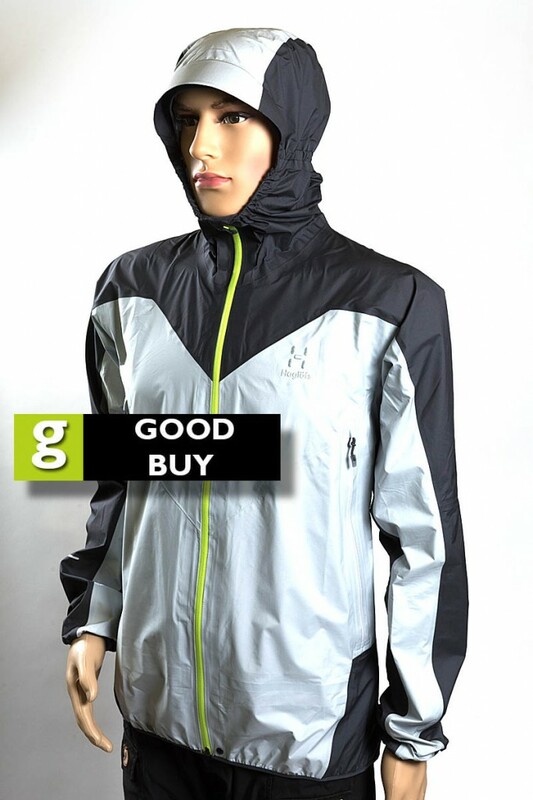 The hood hem is part elasticated, but the slightly stiffened peak is quite short and doesn’t provide much protection for the face as the peak sits quite well back when the hood is cinched in. The hood did, however, accommodate our climbing helmet and turned with the head when cinched. The jacket’s hem has no adjustment, but the rear section is elasticated. The OutDry Ex Featherweight has two zipped chest pockets which are quite roomy. The lining is stretchy mesh, so if you’re not using the pockets to carry items, they can be opened to provide extra venting, though there are no storm flaps so you risk allowing rain in. The sleeves are articulated and the cuffs have hook and loop strips for adjustment. The fit of the jacket, which is part of Columbia’s Titanium range, is fairly roomy. Despite its odd looks, the Columbia jacket worked well. It withstood some very heavy showers without letting any rain in during our testing. The inner face of the jacket stayed reasonably dry when heading hard uphill. The light weight will appeal to anyone who want to keep their pack burden low. The look of the OutDry Ex Featherweight is unconventional which may not suit everyone, but the design is innovative. This jacket is part of Haglöfs’ LIM – Less is More – range, and is pared down to provide a clean, minimalist top designed to protect while keeping weight to a minimum. The LIM Comp jacket uses Gore-Tex Active fabric with C-Knit Backer, which was developed specifically with walkers in mind. It provides waterproofing to an impressive 28,000mm hydrostatic head. The 30 denier ripstop fabric is finished in two shades of grey, with small reflective strips on the sleeves. The jacket’s hem is elasticated but has no adjustment, though there is a press-stud fastener at the base of the zip. The main zip is backed by a storm flap to help keep out the weather. There’s a small softer chinguard strip at the top which provides just enough comfort while keeping weight down. The hood has no adjustment, but is elasticated for the full width at lower head level and there’s also elastication at either side of the cheek area. The hood turns with the head when the zip is fully fastened, though not quite as well as those hoods with adjustment. It also accommodated – just – our climbing helmet though it was quite snug. The semi-stiffened peak is a good size. The hood stayed up in a strong headwind, but did let a little air in at the sides of the face. The sleeves are articulated and have elasticated cuffs. There are two zipped chest pockets with mesh lining which can be opened for extra venting, though there is then the risk of water getting in. Quality of the Haglöfs jacket is good. Comfort was very good, with the LIM Comp Jacket offering good breathability. The LIM Comp Jacket offers proper waterproof protection with no frills, no unnecessary features, and minimal weight. Fit is slightly on the athletic side. The Haglöfs jacket will appeal to hillwalkers wanting performance from a top that will pack right down and won’t add extraneous weight to their rucksack. For those with an eye on environmental credentials, the jacket is also bluesign approved. Keela says the Saxon Jacket is designed with active sport users in mind, and cyclists and mountain bikers will appreciate some of its features, though it will also serve walkers who want a lightweight waterproof. The Saxon uses Keela’s own Flylite Aqua fabric, and our test sample was in a fluorescent green. There are also reflective logos and piping to help visibility. The main zip has a single puller and is backed by a stormflap. The jacket hem has drawcord adjustment with spring toggles. There are two zipped handwarmer pockets and the jacket also has a rear pocket with zip, low down on the scooped back, a feature designed for cyclists. The sleeves are articulated and the cuffs have lightweight rubberised hook-and-loop fastening strips for adjustment. There are also fabric glove loops inside the cuffs. The hood has a wired peak and shockcord adjustment in a halo arrangement with rear spring toggle and side cords with spring toggles. These allow the hood to be cinched in snug against the face to keep out the weather. The hood turns with the head when tightened in. It’s also roomy enough to accommodate a climbing helmet. The Saxon uses a ‘2.5-layer’ construction, with the inner face of the jacket comprising a printed pattern. The Keela jacket is the most competitively priced in the test, and packs down well, with a fairly low weight. 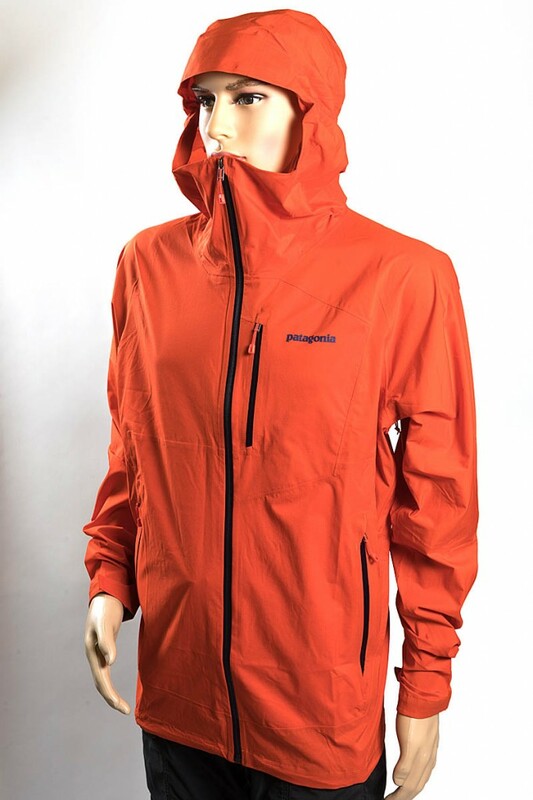 It is ideally suited to runners and bike users, though walkers and climbers will appreciate its lightweight construction and the fact it has plenty of features more likely found in a heavier garment. We used it both on our bike and while walking, and the Saxon worked well for both. 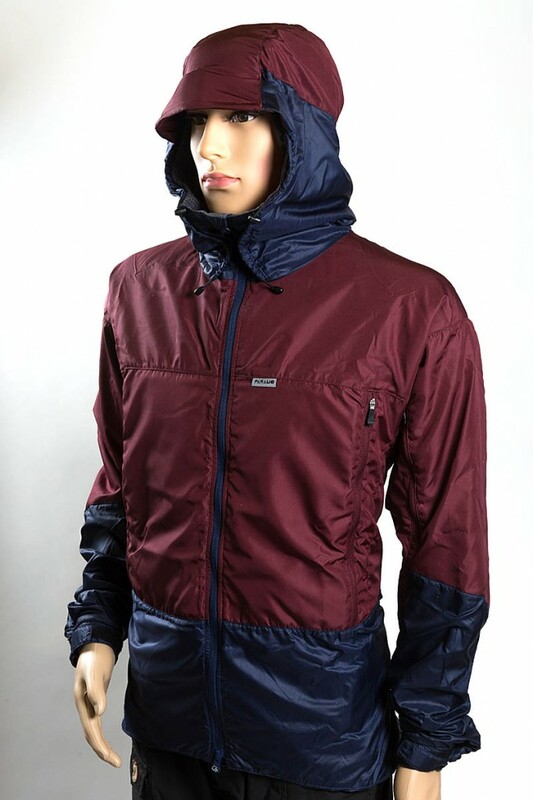 It kept us dry and the light weight of the jacket is useful for moving quickly. Breathability was good, but the inner face did get a little clammy after prolonged uphill sections. The Mammut Kento is a more conventionally style jacket, with most features you would expect on a hillwalking garment. Its weight is kept reasonably low thanks to the 2.5-layer Drytech fabric, though it is still among the weightier garments in the test. The polyamide outer face feels tough, and Mammut says the Kento offers a reassuring 20,000mm water column rating for waterproofing, with breathability of 15,000g/m2/24 hours. The inner face of the fabric has a diamond grid pattern – the ‘0.5 layer’. As with most garments with this construction, there was a slight clammy feel when you’re working hard uphill, but it did shift the perspiration out. The main zip has a single puller and is backed by a stormflap. There’s no chinguard but the jacket wasn’t uncomfortable in that area when fully zipped up. The jacket hem has drawcord adjustment round its full length, with spring toggles. The sleeves are articulated and the cuffs have adjustment tabs with hook-and-loop fastening. There are also pit zips under the sleeves for added ventilation. The jacket has two zipped handwarmer pockets, and there’s an additional zipped chest pocket on the left side. The hood has a good sized semi-stiffened peak and is adjustable via a halo shockcord, plus two side shockcords, with spring toggles. It turns well when cinched and is big enough to wear over a helmet. The hood stayed up well in a strong headwind and was snug enough round the face to keep out the wind. Quality of the Mammut jacket is good and its styling is clean. Its cut is on the athletic side of standard, and is aimed at mountain walkers and mountaineers. The Mammut jacket is bluesign approved. 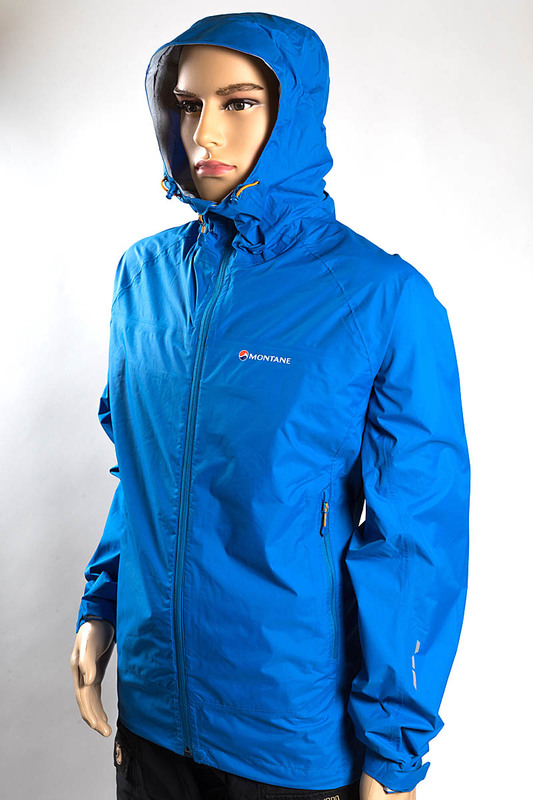 Montane have created a conventional mountain-goers waterproof jacket at a fairly moderate weight. The Atomic uses Pertex Shield in a 2.5-layer design. The outer face of the jacket has a slight sheen and a softish feel. The lining face has a diamond grid pattern. The jacket’s single-puller main zip is backed by a storm flap and there’s a softer chinguard section at the top. The Atomic’s hem has drawcord adjustment through its full length, with spring toggles. There’s also a press-stud fastener at the base of the zip. The jacket has two zipped handwarmer pockets with mesh lining. The jacket’s sleeves are articulated and the cuffs have conventional adjustment tabs with hook-and-loop fastening. There are also pit zips for extra ventilation, both of which have a storm flap. The hood’s peak is a good size and is semi-stiffened. It also has wire adjustment. The hood’s volume can be adjusted by the halo drawcord and there are side drawcords with spring toggles too. It works well, turning with the head when cinched. It’s big enough to go over a climbing helmet. The hood isn’t particularly big but the peak did block wind-driven rain quite well. When the hood is fully cinched in, the jacket covers the mouth which is good for keeping out the elements but might restrict the flow of air when pushing hard uphill. Not the lightest of jackets, this Páramo uses the brand’s Analogy system, said to mimic how animal fur repels rains. Rather than having a waterproof membrane, the Velez uses a ‘pump action’ to move water and water vapour outwards. This creates a thicker, and heavier, material compared to conventional waterproof fabrics, and the Páramo jacket is the weightiest in the test. But the Velez has a nice, soft feel to it, which makes for a comfortable day on the hills. It also affords a little warmth, useful on those cool days. It is bulkier than the lightweight jackets that rely on membranes. Páramo pitches the Velez jacket at multiple users: mountain walkers, cyclers, climbers and backpackers, emphasising its versatility. It’s cut more athletically than many offerings in the Páramo collection, and has a low scooped back, useful on the mountain bike. There are added ventilation features too. The outer zip of the two pockets open to reveal a vent covered by the lining’s mesh. Within this a second zip gives access to the pocket itself, which is partly mesh lined. The right-hand pocket has a small webbing loop within it for attaching an item such as keys. The jacket also has vents under each sleeve forearm; not quite pit zips – they don’t go all the way through the armpit – but did provide some extra cooling air. In keeping with its multi-use design, the Velez has small reflective triangles on the back and front of the shoulders and on the hood. The jacket’s main zip is backed by a storm flap and has a double puller. 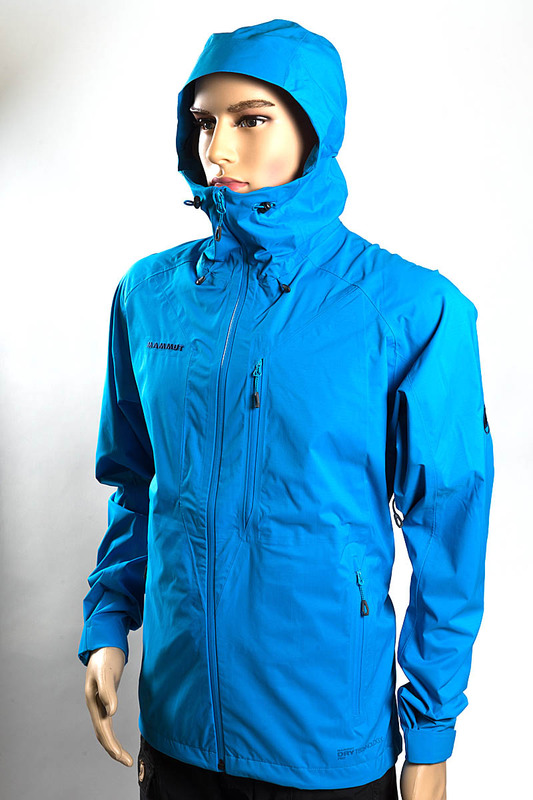 The hood has a wired peak and has adjustment via a rear halo shockcord and spring toggle, plus twin side cords at the front, again with spring toggles and tethered into a sleeve to stop them blowing up into your face. The hood worked well and turned with the head when cinched in. It accommodated a climbing helmet. The lining of the Velez is a diamond-pattern mesh with finer mesh infill and this worked well at shifting perspiration away from the body. The rear section of the jacket’s hem has drawcord adjustment with spring toggles. The sleeves are articulated and cuffs have hook-and-loop strips for adjustment. Páramo’s traditional market has been the ‘rambler’ taking to the countryside and hills, but in recent years it has produced designs aimed at faster moving outdoors enthusiasts and the Velez jacket is one of these. The venting options and more athletic fit make it a good choice for people who mix hillwalking with other activities in the outdoors, though the soft material makes it hard to get that sleek look that conventional outdoor clothing often conveys. But ventilation was good and the jacket did keep us dry during our outings. One thing to bear in mind is that the Páramo jacket will need regular proofing with the recommended Nikwax solution or something similar to keep its performance up to scratch. If you lean against or sit on something wet, it will transmit some of the water through because of how the Analogy system works. Breathability was among the best in the test. The green credentials of the jacket, made at the Miquelina Foundation in Colombia, are good too, with no fluorocarbons used. Quality was also very good. The Rainshadow is a slightly stretchy shell jacket that uses Patagonia’s H2No waterproofing system. Though described as paintbrush red, it’s at the bright, almost orange, end of that part of the spectrum. It’s a clean, minimalist design, with a water-resistant main zip with a single puller. The zip is backed by a storm flap. Fabric is a ripstop material with a two-way stretch. It’s a 2.5 layer fabric, with the inner face having a slightly raised pattern to try to help with comfort and shifting perspiration. The jacket has a fairly soft feel and wasn’t particularly rustly in use. The jacket has a full-width drawcord at the hem, allowing cinching in to keep out updraughts. The hood is fairly small, but it did accommodate a climbing helmet. It has a semi-stiffened peak and adjustment is via a single rear halo-design shockcord with spring toggle. This did leave a little gap at the sides of the cheeks, allowing headwinds to get in. When fully cinched, the peak sits quite a way back on the forehead and didn’t provide much protection against driven rain. The Rainshadow has pit zips that run for a good length and provided ventilation under the arms and into the chest area when working hard. They have storm-flaps and twin zip pullers to give good adjustment. There are two zipped handwarmer pockets plus a smaller zipped chest pocket. The sleeves are articulated and have cuffs with hook-and-loop adjustment strips. Cut of the Patagonia jacket was fairly generous. The stretchiness of the fabric meant there was no restriction of movement when reaching up for holds. The Stretch Rainshadow is a clean design which helps keep the weight down to a reasonable level. It’s a good choice for general hillwalking. Quality was good. 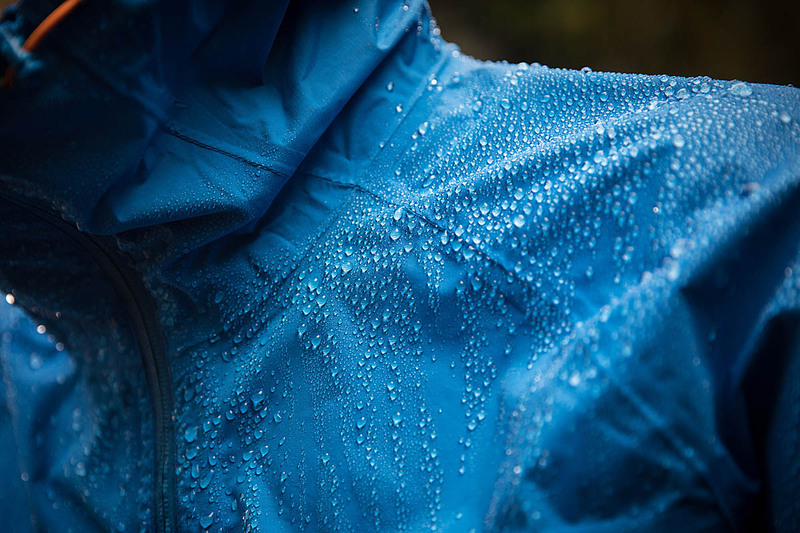 Patagonia rates the jacket’s waterproofing at 20,000mm hydrostatic head, thanks to its membrane and durable water resistant treatment to the face fabric. It also has a simulated punishing test that simulates prolonged wear and washing and says that, after this, the rating is still 10,000mm. Packability was very good; the jacket actually packs into the chest pocket when not in use, and there’s a narrow fabric loop to attach it to a carabiner or similar. 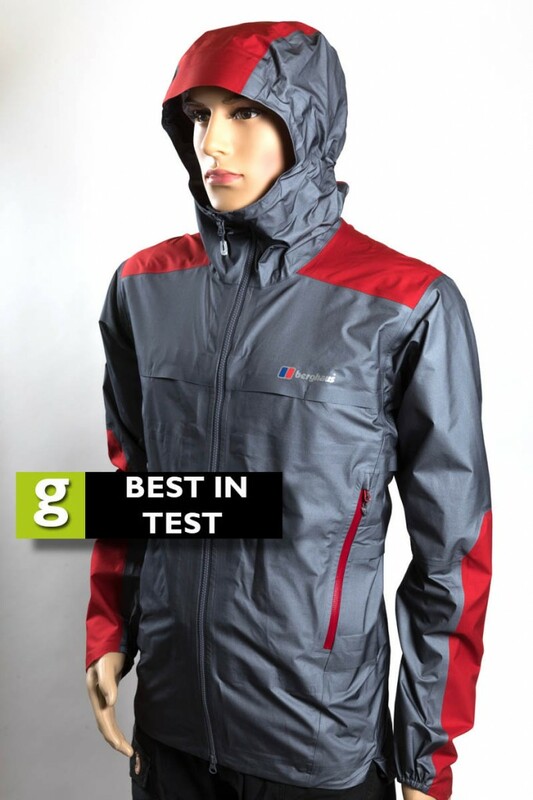 The Berghaus GR20 Storm took the honours as the best jacket in the test, though it’s also the most expensive. The Sunderland brand’s designers have come up with a well-thought-out, innovative garment that performed very well and offered all the protection you might expect from a jacket double its weight. Close behind was the Haglöfs LIM Comp Jacket which again performed well and had good design features, combined with quality. For those counting every gram, the Columbia Outdry Ex Featherweight Jacket lived up to its name, tipping the scales with a lower weight than any other in the test. If you can live with its unusual looks, it’s a very good performing piece of kit. Keela’s Saxon provided the keenest price for a lightweight jacket, with Montane’s Atomic also providing protection at a good price. 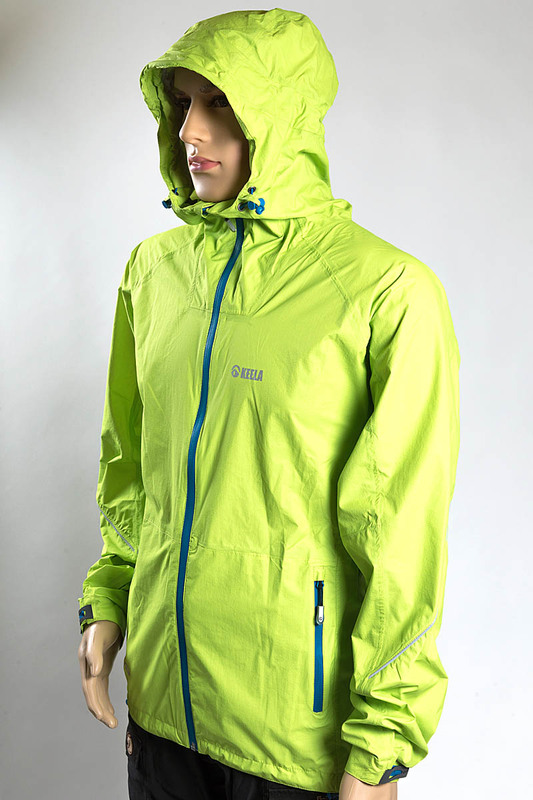 Páramo’s Velez Jacket works very differently from other jackets in the test and is a different design completely. Fans of the brand will appreciate its more athletic cut and versatility. All the jackets were supplied to grough by the brands.